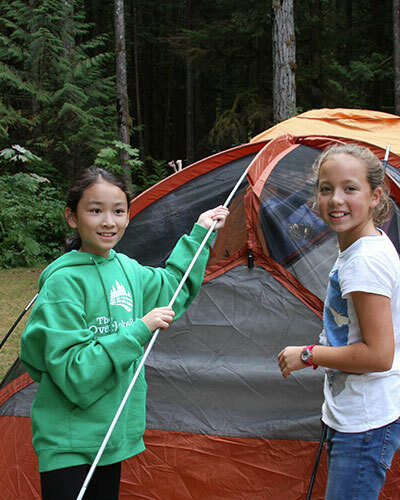 The arts curriculum at Overlake is designed to inspire life-long involvement in and appreciation for the visual and performing arts. 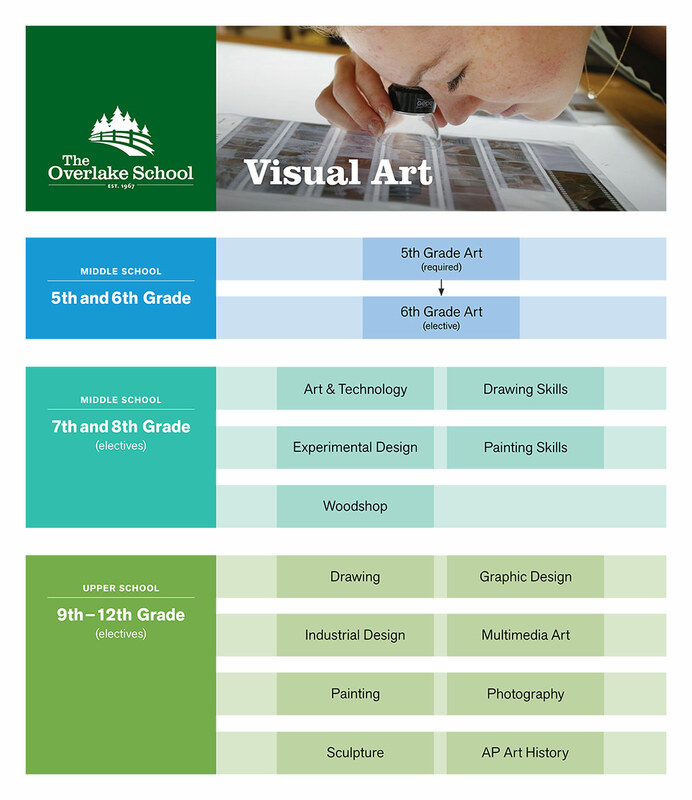 Overlake offers a tactile, balanced, and discipline-based arts program that develops students’ abilities in perception, comprehension, creativity, and aesthetic values. Our goal is to provide students with a broad spectrum of opportunities to develop these skills and encourage divergent thinking and self-expression. The range of offerings includes drama, stagecraft/technical theater, vocal and instrumental music, traditional and experimental two and three dimensional visual arts courses, digital art making, and design classes. Required courses in the arts are meant to encourage all students to explore venues that are perhaps new to them, while also allowing for specialization and more in-depth study in a particular area of interest. Students may see their art works displayed around campus: in our outdoor gallery, the Campus Center or in the Fulton Performing Arts Center. Choirs, bands and orchestra perform several concerts throughout the school year, and compete in choral and instrumental festivals and contests. Our theater department presents three or four productions each year with options for Middle School and Upper School students. Most productions are offered as classes with an additional after school rehearsal schedule. All students may audition for the biennial All-School Musical, or help produce it, as a co-curricular option. The following chart lists the US courses available to meet the arts graduation requirement. Activities in this introductory trimester course are devoted to developing essential life skills such as creativity and innovative thinking. The primary focus of the course is to explore different mediums and approaches to making art through experimentation, practice, and play. This semester course aims to develop essential life skills such as creativity and innovative thinking. Students will be offered a variety of choices as they begin to shape their own artistic investigations. We will explore different mediums and approaches to making art through experimentation and practice. Drawing Skills is an introductory course which focuses on creativity and innovative thinking. Students will practice techniques, set goals, and develop ideas through the exploration of various drawing materials such as: graphite, charcoal, ink, pastel, watercolor, and mixed media. This course provides the time and space for experimenting, taking creative risks, practicing, receiving constructive feedback, reflecting, revising, and refining work over time. This course is all about challenges! Students are given a material and a subject and challenged with constructing a 2- or 3-dimensional piece, emphasizing invention and creativity. The course will cover the fundamentals of design through experimenting, taking creative risks, practicing, receiving constructive feedback, reflecting, revising, and refining work. In this course students will use an amazing array of materials from LED lights and motors to discarded books and magazines, to cardboard boxes, wire, and fabric. Sketch books are kept throughout the term to jot down ideas and work on fun (and sometimes pretty funny) exercises. Painting is an introductory course which focuses on creativity and innovative thinking. Students will learn various acrylic painting techniques. Through the process of creating several paintings, students have the opportunity to set goals, develop skills, and communicate ideas. This course provides the time and space for experimenting, taking creative risks, practicing, receiving constructive feedback, reflecting, revising, and refining work over time. Woodshop introduces students to the safe use of power and hand tools, mechanical drawing, and woodworking skills. Students are taught woodshop protocol and safety precautions when working in the woodshop. Cutting boards, boxes, and step stools are examples of projects made during the term, in addition to a creative project of their own choosing for their final project. US Drawing is an introductory course with emphasis on basic drawing skills using a variety of materials and techniques. Drawing is a fundamental activity in the visual arts which involves critical thinking, learning to ask questions, and making judgments. Artistic engagement in drawing can lead to understanding and appreciation of the multiple perspectives of self, others, and the world around us. This course introduces students to a visual art vocabulary that helps to interpret and understand works of art. Students will be challenged to deepen their experience as an artist by experimenting, taking creative risks, practicing, receiving constructive feedback, reflecting, revising, and refining work over time. One semester of any visual art elective. This visual art class will introduce students to industrial design by developing concepts and specifications through drawing, making prototypes, analysis of data found through trial and error. Students will use a variety of materials to create prototypes of their designs. Students will learn traditional skills such as working with metal, woodworking, and project layout. In addition, students will gain experience and skills for working with CAD software and CNC hardware. Student projects will require creative problem solving, critical thinking, and experimentation through design. US Painting is an introductory course which teaches basic painting skills using a variety of painting materials and techniques. This course introduces students to a visual art vocabulary that helps to interpret and understand works of art. Students will be challenged to deepen their experience as an artist by experimenting, taking creative risks, practicing, receiving constructive feedback, reflecting, revising, and refining work over time. Artistic engagement in painting can lead to understanding and appreciation of the multiple perspectives of self, others, and the world around us. This hands-on course is a general introduction to the visual arts. Students spend the semester experimenting with materials in order to create collages, drawings, paintings, hand carved block prints, as well as two-dimensional design pieces. We will emphasize trial and error, experimentation, and skill building. The course emphasizes visual art making, vocabulary, techniques, taking creative risks, and taking on a multitude of challenges. Artistic engagement can lead to understanding and appreciation of the multiple perspectives of self, others, and the world around us. This hands-on course is an introduction to sculpture in the visual arts. Artistic engagement with this medium can lead to understanding and appreciation of multiple perspectives of self, others, and the world around us. Students spend the semester experimenting with 3-dimensional forms, shapes, balance, techniques, and materials. We will emphasize trial and error, along with experimentation, to move from traditional to experimental skill building and conceptual ideas. Upper School semester elective. Permission from instructor required. At least one semester of Multimedia Art, Painting, Drawing, or Sculpture required, in addition to permission from instructor. This course is for juniors or seniors who have already taken one semester of Drawing, Painting, Sculpture, or Multimedia Art and have the desire to work more independently and with greater depth in those areas. It is also ideal for those who'd like to combine two or more of those categories with more intentionality. As the nature of this course is more independent in nature, students need to have successfully exhibited the discipline and motivation necessary for in-depth study of their chosen medium. This trimester course provides exposure to a broad range of music skills, and an introduction to instruments and the voice. Students will actively participate in an exploration of musical styles through various games and activities designed to develop a strong foundation for future music courses. A celebration of different musical cultures will also play a key role in the curriculum of this course. Students will have the opportunity to sing as a vocal ensemble as well, with options for performance at the end of the year. After school elective. Monday/Wednesday, 3:15 - 4:15pm. Beginning Band is an after school elective class designed for students in the 5th, 6th, 7th, or 8th grade who wish to play a concert band instrument. Students will be guided in the selection of an appropriate instrument and taught the fundamentals of tone production, counting rhythms and note accuracy. The following instruments are taught: flute, clarinet, trumpet, trombone, electric bass, and percussion. Note: students wishing to play percussion will begin on keyboard percussion, snare drum, and bass drum. The 6th grade band is a two-semester course designed for students with previous experience on an instrument. The focus of this course is to increase individual and group performance skills on the following instruments: flute, clarinet, trumpet, trombone, keyboard percussion, and snare drum. Students will review the fundamentals of playing their instrument and will continue with the basics of tone quality, intonation, articulation, and dynamics. The Sixth Grade Band will perform at two concerts during the school year. The 6th grade choir is a one-semester class designed for all students regardless of previous singing experience. This ensemble is an excellent foundation for students interested in vocal development during their middle school years. The study of basic music theory and sight singing will be emphasized as students prepare repertoire for one concert performance at the end of the semester, with other opportunities to be determined. Beginning Strings is an after school elective class designed for students in the 5th, 6th, 7th, or 8th grades who wish to play a string instrument (violin, viola, cello, or string bass), but have had little or no previous experience. In the first classes, students are guided in the selection of an appropriate instrument. In the early part of the first semester we will learn the proper way to hold both the instrument and the bow. Note naming, rhythm counting, and tone production will be the foundational work, with the introduction of a variety of songs and exercises rehearsed throughout the semester. Beginning Strings will have the opportunity to perform during the Winter and Spring Orchestra Concerts. Semester elective. Club time commitment. This introductory course is designed for students in the 6th, 7th, or 8th grade who wish to begin study on a band instrument but are unable to participate in the after-school elective course. Class is held three times within the 8-day schedule rotation, on designated club days. Students will be guided in the selection of an appropriate instrument and taught the fundamentals of tone production, counting rhythms and note accuracy. The following instruments are taught: flute, clarinet, trumpet, trombone, electric bass, and mallet percussion/snare drum. Full-year recommended; May be taken as a one-semester course, with permission of the instructor. This course is a continuation of the band curriculum, designed for students wanting to continue their studies on their instruments in Concert Band or Jazz Band in the upper school. Students will focus on the basics of good tone quality, intonation, balance, blend, technical accuracy and musical style. The seventh and eighth grade band will perform at two school concerts per year. At least one year of playing experience is required for enrollment in this class. The Seventh and Eighth grade choir is a course designed for students with varied degrees of singing experience. Participation in this ensemble will continue to develop students’ performance skills and strengthen their foundation for further exploration in vocal or choral ensembles at Overlake. As a group, we will work on the basics of healthy vocal technique, teamwork, creating a safe space for expression, good musicianship, and sight singing. Students will rehearse repertoire in preparation for one concert, with a possibility of other performance dates to be added, if time permits. 6th - 8th semester elective. Club time commitment. 7th-8th grade semester ARTS elective for spring. At least one year experience or instruction on a string instrument. Intermediate Strings is a course for 6th, 7th, and 8th grade players beyond the introductory level. Students should have at least one year of playing experience on violin, viola, cello, or string bass. Class is held three times within the 8-day schedule rotation, on designated club days. In addition, every Tuesday morning, there will be an optional rehearsal during zero block (7:20am - 8:05am) for any available players. This rehearsal will provide a weekly opportunity for students to gain additional experience with the String Orchestra players for more advanced training and sectional work. Emphasis in this course will be placed on ensemble building as well as technical proficiency, tone production, and musicianship. NOTE: 6th graders enroll for Intermediate Strings full year. 7th & 8th graders enroll for Intermediate Strings fall semester, and should then register for spring semester as an Arts Elective (B block) course. Full year recommended; may be taken as a semester course. At least two years previous strings playing experience. 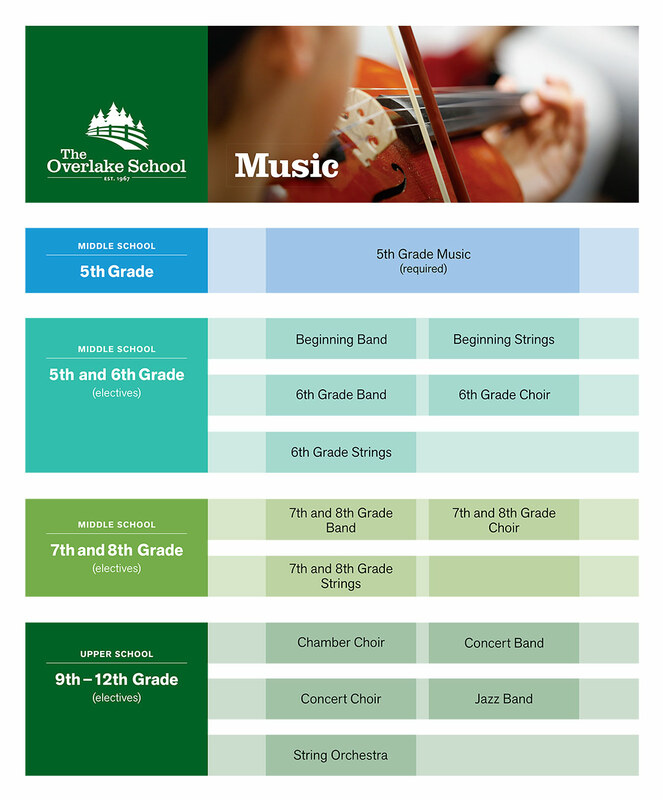 The Overlake String Orchestra is open to string players in grades 7 through 12 with at least two years of previous playing experience, or permission of the instructor. This ensemble plays three concerts a year featuring music for string orchestra and small chamber ensembles, as well as selected works including woodwinds and brass, and concertos featuring student soloists. There are opportunities to perform in solo and ensemble festivals at both the middle and upper school level. Emphasis is on developing and improving ensemble and individual performance skills, as well as sight-reading ability. Repertoire will include music from a variety of composers and genres. Skill proficiency on one of the instruments listed below. This course is designed to advance performance skills in a symphonic ensemble setting, and to offer further leadership experience to upper school students wishing to hone their skills and technique on their instrument. Emphasis is placed on refining the basic skills of intonation, dynamics, articulation, balance, blend, and phrasing through rehearsal and performance of a variety of concert band, pep band, and jazz repertoire. There is no limit to the number of instruments that can participate in this group. Concert band instruments include trumpet, trombone, French horn, baritone, tuba, flute, clarinet, oboe, saxophone, percussion and string or electric bass. The Overlake Concert Choir is a performance ensemble class designed for all grade levels in the upper school, regardless of previous singing experience. Students will rehearse choral literature in many styles and languages in preparation for the Winter Concert (December), the Spring Concert (April or May), school assemblies, graduation, and other performance opportunities throughout the year. This course will emphasize healthy vocal production, ensemble skills, basic music theory, strong group dynamic and cooperation, and sight singing. New players interested in auditioning must currently be enrolled in Concert Band. Auditions will be held in the Spring of the previous year for enrollment in the fall. Interested students should see the director for a set of audition music as early as possible in order to prepare an audition. The Overlake Jazz Band is an active ensemble, performing frequently on and off campus for a variety of audiences. The musical focus will include a variety of jazz standards from the big band and be-bop eras as well as contemporary swing and jazz/rock compositions. Students in Jazz Band are required to commit to a rigorous rehearsal/practice schedule and several community performances throughout the year. In addition to performance repertoire, classroom activities will include the study of improvisation, memorization of scales, and the opportunity to work with guest artists. Proficiency on saxophone, trumpet, trombone, piano, bass, guitar and drums is required. Previous choral experience is recommended, but not required. Two-semester commitment is preferred, but not required. By audition only. Auditions will be held in the spring of the previous year for enrollment the following year. The Overlake Chamber Choir is a select ensemble open to sophomores, juniors, and seniors by audition only. Members should possess skills in leadership, teamwork, and collaboration, in addition to the ability to sing independently with confidence. This course will emphasize healthy vocal production, ensemble skills, music theory, sight singing, and effective, positive group dynamic. Musical focus will be placed on a variety of styles and languages, and the study of more advanced choral repertoire. This course focuses on the basics of music theory and music history through active listening and exploration of different time periods and forms. Students will learn to recognize and analyze musical elements – including sound, rhythm, notation, melody, harmony and texture – in a wide variety of musical styles. Students will experience music from the Middle Ages, Renaissance, Classical, Romantic, 20th and 21st centuries through live and recorded performances. From Mozart to Lin Manuel-Miranda, students will explore selected topics in depth, including a project on Music in Film. Required attendance at three live musical performances throughout the semester is part of the course structure; two of these performances will be scheduled with the instructor as a group activity, and the other may be scheduled individually. Because of the length of the course, Western musical tradition will be its primary focus. This trimester drama class combines skill building in acting and movement to develop ease and range for creative self-expression. Students explore through exercises, games, improvisations and script writing. Students develop skills in relaxation, kinesthetic awareness, memorization, employing creative problem-solving skills, and working effectively as part of a group. Students in sixth grade drama learn techniques to improve their physical and vocal performances. Students develop skills in presenting for an audience, kinesthetic awareness, memorization and working effectively in a group. Units of study may include storytelling, Shakespeare and scene work. Previous drama classes and/or performance experience is necessary for enrollment in this course; priority will be given to 8th graders. Course may be repeated with permission of instructor. This course explores acting and collaborative ensemble work through rehearsal and performance of a play or musical. Students explore voice, movement, and characterization, and then apply these skills in a dramatic context. Performance dates: TBA. Please note: Mandatory after school rehearsals will be held during the weeks prior to the public performances. This class combines many forms of improvisation to explore characterization and dramatic structure. Students develop skills in relaxation, kinesthetic awareness, trust, and effective group work. Learning and developing skills in Theater Sports forms and Canadian Improv Games are a major component in this class. Individual and group-prepared improvisations using different themes are rehearsed for presentation to an audience. There is a final sharing at the end of the term for an invited audience. 7th and 8th grade semester elective. Students will be required to participate in at least one out of three Pacific Northwest Middle School League Debates which will be on a Saturday. In this course we will focus on strengthening public speaking skills, research skills, building an argument with evidence, and rebutting an opponent’s argument. Students will have an opportunity to test out their skills by competing in the Pacific Northwest Middle School Debate League. Students will be expected to research current events, work cooperatively in small groups and be willing to make their voice heard. Creative Movement is designed to get students comfortable in their bodies using a variety of techniques and improvisation work. Students will develop an understanding of how to create character and develop a sense of bodily awareness through various genres of dance, including exercises in coordination, rhythm and patterns. The semester will end in a culminating piece in which the students share their work. The class is designed to give students tools to develop their skills in acting through exploring mask /movement work, truth in comedy and a variety of improvisation. Students practice “thinking on their feet” through exercises, games and both short and long form spontaneous scene building. The class will explore the craft of comedy through exposure to great sketch comedy work by Buster Keaton, Monty Python and others. Exploring Improvisation through mask work is also a component of the class. The origins of farce and considering commedia dell'arte characters are also part of the explorations in this workshop. Developing active listening skills and working well with fellow performers and an audience will also be part of the work and fun in this course. Students may choose to participate in local area High School Improvisation tournaments. Theatre for Change uses drama, storytelling, improvisation and the work of Augusto Boal to reflect, create and provoke change. Current events/issues, personal stories and historical cases are used as a starting point for this course. Each student will use theatre as a tool to analyze characters, write, make change and grow into their authentic selves. There will be a culminating piece at the end of the semester in which students are encouraged to investigate their personal connection to issues. Page to Stage is focused on adapting books and written-works into plays. The class will read and analyze literature, devise scripts, and bring a brand new creation to life on stage. Skills in collaboration, imagination, and creativity will be honed over the course of the semester, as we also explore acting technique, the play structure and improvisation. At the end of the semester, there will be an opportunity for students share their work. This course introduces a range of performance skills from visual storytelling to improvisation and dramatic text interpretation. Through exercises and games, students develop kinesthetic awareness, concentration, and confidence in public speaking and presenting to an audience. Various dramatic forms are investigated, including modern realism and scenes from Shakespeare. The medium of film is also explored through film scenes shot in close-up and played back for analysis. Upper school semester elective. Students will be required to spend four hours outside of class at work parties or similar production events over the course of the semester. Upper School FALL semester elective. Instructor signature required. Performance Dates: TBA. Students enrolling in Advanced Drama who also participate in Fall Sports will need to discuss conflicts and options with the instructor. Prior theater experience is preferred, but not required. Availability for after school rehearsals is required during the weeks prior to performance. This semester-long class is designed for acting students with particular interest and experience in performance. This class culminates in a production that will be presented for the school community as well as for the public. Students taking this class must approach their craft of acting with professionalism and leadership. Advanced Drama provides emphasis on acting methods, script analysis, movement and vocal work, and performance preparation. Past productions include The Complete Works of William Shakespeare (Abridged), Nicholas Nickleby, Museum, Radium Girls, Almost, Maine and Our Town. The cast will be required to commit to a rigorous rehearsal schedule in the final weeks before performance which includes after school and weekend commitments. Upper School semester elective. Instructor signature required. Previous theater experience is recommended, though not required. This semester-long course is designed for students with particular interest in musical theater performance. In this course, students will have the opportunity to integrate their skills in acting, singing, and dance in a challenging and intricate musical theatre production. Past productions include Once On This Island, The Mystery of Edwin Drood, The 25th Annual Putnam County Spelling Bee, Big Fish, and The Addams Family. Students taking this class must approach their craft of acting with professionalism and leadership. The cast will be required to commit to a rigorous rehearsal schedule in the final weeks before performance which includes after school and weekend commitments.